My niece turns 8 today (happy birthday to her!) and being of an age where cake styles really matter, I offered to make a cake to her specifications. Her request, somewhat predictably, was "strawberry or pink". I decided to make a strawberry layer cake. For the strawberry layers, I adapted a basic vegan vanilla cake by adding 500g (two punnets) of strawberries, pureed, plus some pureed raspberries for bonus colour. For the vanilla layer, I just made the vegan vanilla cake with a few minor adaptations. Easy. Strawberry icing, my friends, is a little more tricky. I can say with certainty that the best approach does not involve adding 500g of pureed strawberries to an icing batch. If you take that route, your icing will never set, even if you add nearly 1 kilogram of icing sugar and throw some cornflour into the mix too. You'll just end up with sticky, super sweet, runny pink icing and no remaining icing sugar in the house. I eventually managed thick icing by making another plain batch and slowly adding some of the runny pink strawberry icing into that mix. It wasn't an ideal approach. If you are happy to use food colouring, you could skip this hassle and just add a few drops of red and some strawberry essence. If you are like me and would prefer to avoid food colouring, I have included a rough icing guide below. However, please do note that I took a very circuitous route to my icing and you may want to exercise your own judgment in how many strawberries to use! Prepare 3 x 15 cm / 6 inch pans; or prepare 2 x 15 cm / 6 inch pans and make your strawberry cakes in 1 pan, cutting the resulting double-height cake in half when cool; or plan to make the cakes in batches if you don't own enough pans. Preheat your oven to 180'C / 350'F. Puree the strawberries and raspberries in a food processor or blender, or using a hand mixer, until smooth. Set aside. In a large bowl, combine the dry ingredients (flour, sugar, baking soda, salt) and stir to combine. Add the milk, oil and apple cider vinegar and stir through. Add the pureed berries and mix to incorporate. Divide batter between two pans (or bake in one if choosing that route) and bake for 35 - 40 minutes or until an inserted skewer comes out clean. If you bake the cakes double height in one pan, you will need to add at least 10 minutes to the baking time. In a large bowl, combine the dry ingredients (flour, sugar, baking soda, salt) and stir to combine. Add the milk, oil, apple cider vinegar and apple sauce and mix to incorporate. Pour batter into a prepared cake pan and bake for 35 - 40 minutes or until an inserted skewer comes out clean. Cream the non-dairy spread and sugar until fluffy. Gradually add the pureed berries, beating regularly to incorporate. Place one strawberry cake on a large cake board. Top with strawberry icing, add the vanilla cake layer, and again top with strawberry icing. Add the final strawberry cake layer. Cover top and sides with strawberry icing and decorate as desired (I drizzled mine with melted dark chocolate and scattered over candy stars). My initial batch of strawberry icing didn't work out, so I made a second batch that creamed non-dairy spread and sugar in the quantities listed above, but then added strawberry flavours from my initial runny icing. I am slightly estimating the quantities needed for the berries. I am pleased to say the pink colours were a big hit with my niece, and the cake went down well with children and adults alike. 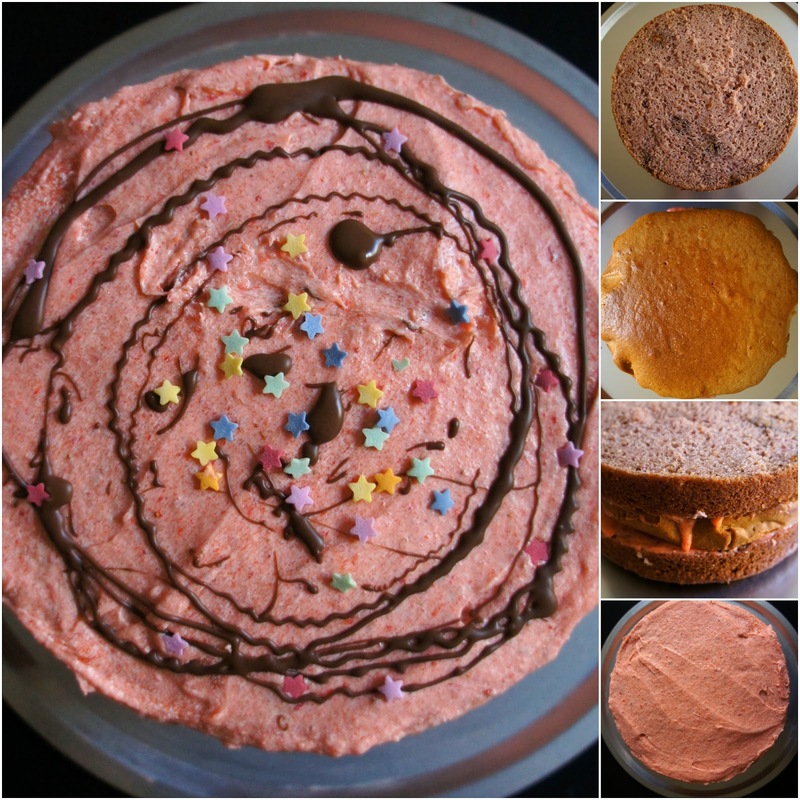 I will definitely be making strawberry cake to this specification again, as it gives a super moist cake that is slightly different to most berry-containing cakes I've had before. 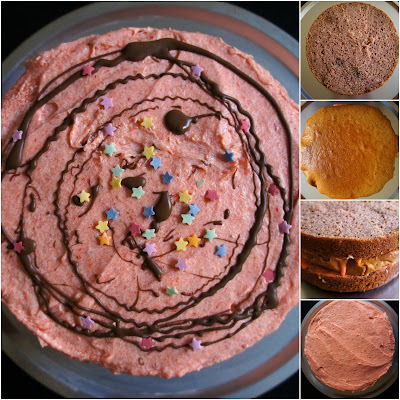 Do you have tips for pink, food colouring free icing that stays thick?! A pink cake! What a feat! I'm sure your niece loved it and so much nicer to have homemade than store-bought. What a lovely treat for your niece! Not every day you see the word "phlebotomist" in a post about a bright red cake. Pretty in pink and perfect for a princess. Enough alliteration? She must have been very pleased to eat this. Beautiful alliteration :-) Thanks Maureen!